This lovely 4 bedroom family home is cavity built and offers nearly 3000 sq ft of accommodation, situated on a well regarded clos in a quiet location in the North of the island. Accommodation comprises a lovely lounge/dining room, spacious kitchen/breakfast room, utility room with access to the garage, bedroom 4 and shower room on the ground floor. 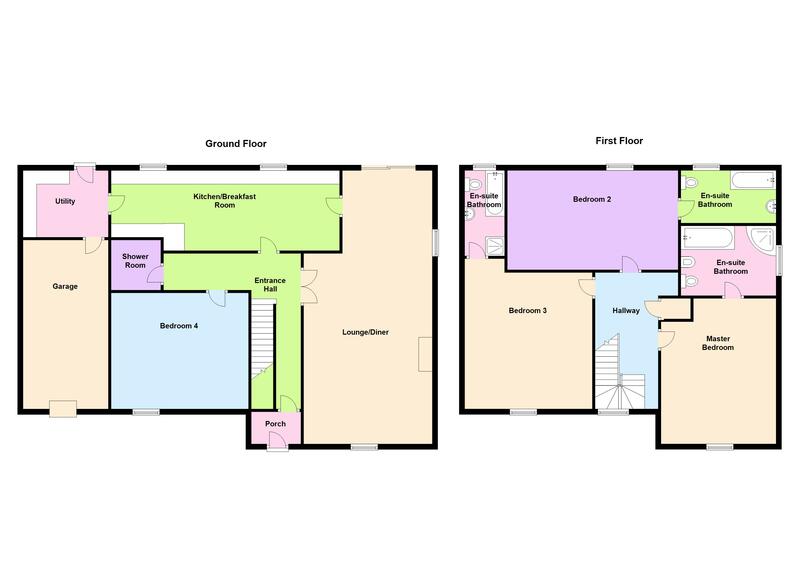 A lovely large master bedroom, 2 further spacious bedrooms all complete with their own en-suite bathrooms on the first floor as well as attic space. Outside provides ample parking, a garage and a low maintenance enclosed decked garden. This fantastic family home is well worth viewing so call Cranfords today on 243878 to book! 21'4'' x 12'3'' max. Appliances include four ring ceramic hob, extractor fan, dishwasher, microwave, electric oven and grill, fridge/freezer - all integrated. 9'11'' x 7'11''. Tumble dryer. All mains. Oil fired central heating.